Boiled Shack-tastic Platter for One! One of my new favorite places on Buford Highway is Crawfish Shack Seafood, a Vietnamese owned restaurant serving Cajun classics at great prices. The restaurant was featured in this NY Times article about the prevalence of Vietnamese-owned Creole/Cajun restaurants. 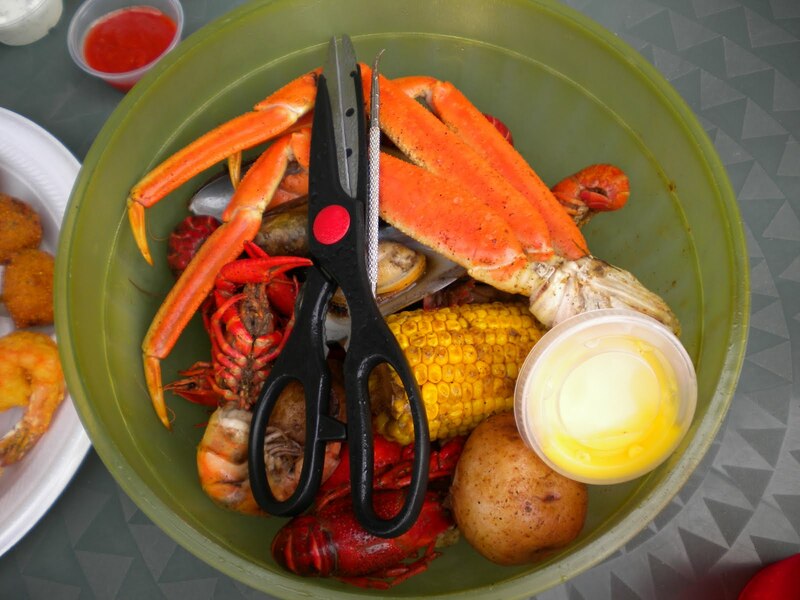 Everything we've tried here pleased us, especially the boiled seafood - crayfish, shrimp, wonderful crab, and mussels too - the hush puppies and the beignets. There is nice, nautical themed seating inside, but luckily both times we've ventured here we've managed to secure one of the two outdoor tables in the front. The restaurant is in a brand new strip that is a bit difficult to see from the road. Raw seafood is also available to buy and cook at home. But why do that when it's so great here? 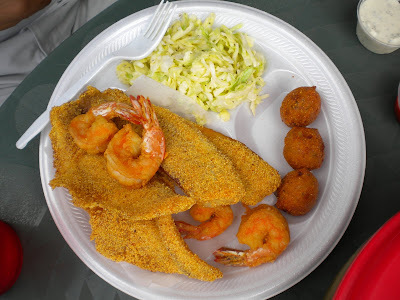 Tilapia, shrimp combo with hush puppies and slaw. A friend of my suggested WaterHaven for lunch a few weeks ago. We braved the heat and walked from her nearby loft, sitting on the shaded patio. 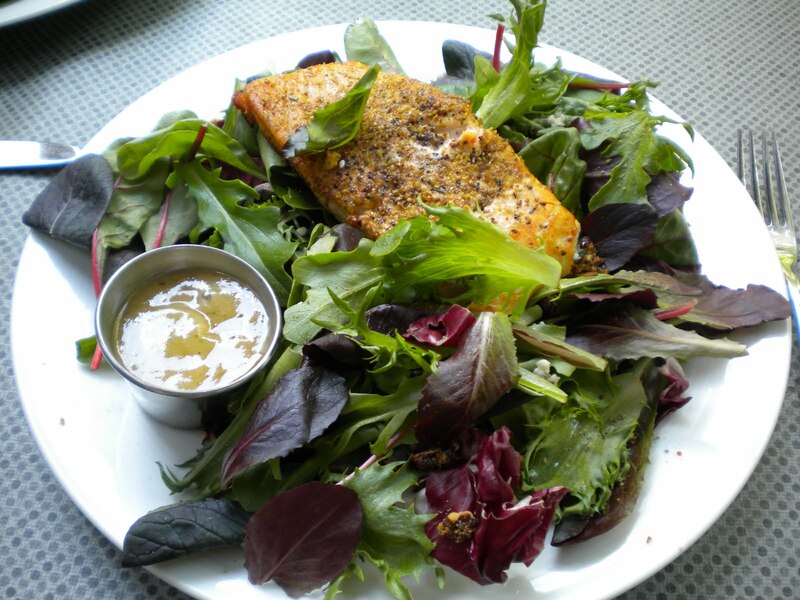 Both of us ordered salads with salmon, a standard option done fine here. Since we dined I've heard that the restaurant is "undergoing renovations". Not sure when they will re-open. Anyone have news on this? Fried Alaskan Whitefish with Popcorn Shrimp and Sweet Potato. 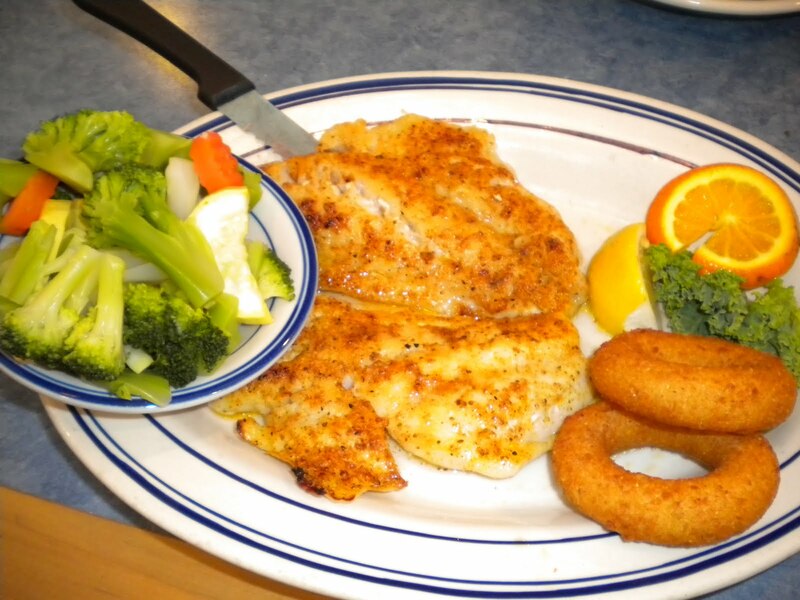 Seabreeze Seafood Restaurant is one of Douglasville's best places for seafood The value is also excellent as the portions are huge! 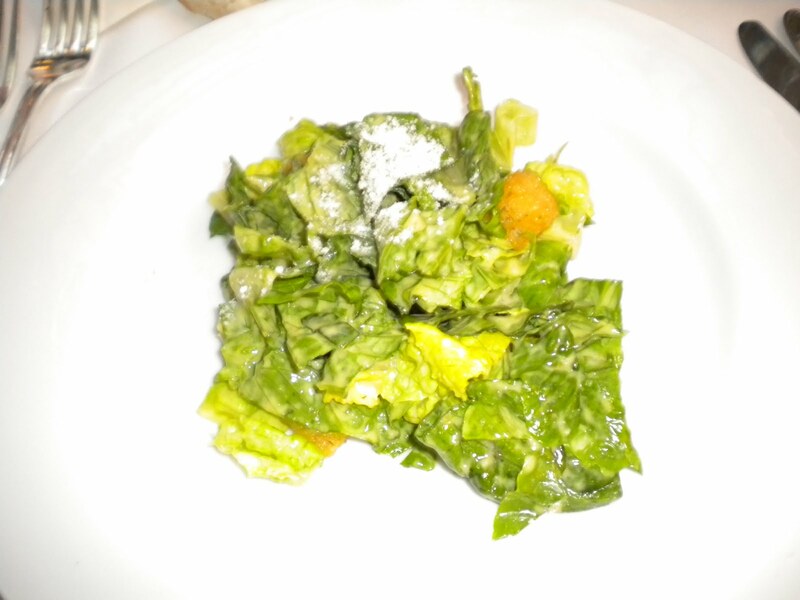 One of the entrees came with a very nice salad (not pictured) as well. 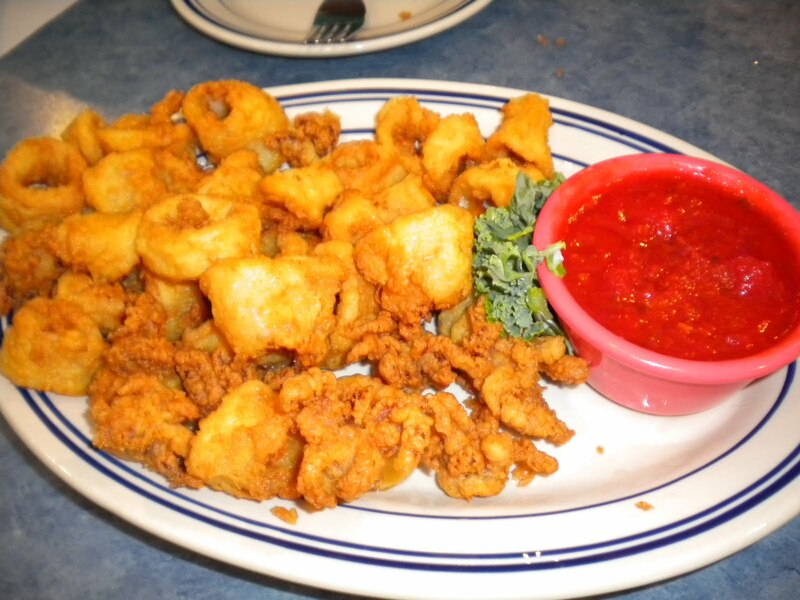 The highlights: the calamari and the popcorn shrimp. I definitely recommend this place if you're in Douglasville and in need of a good meal. Check out the daily specials, including all you can eat shrimp on Wednesdays. 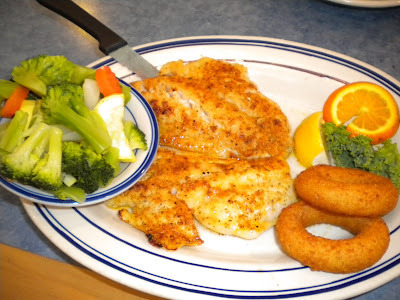 Broiled filet of red snapper with vegetables. Coconut shrimp side and Waikikie Combo. 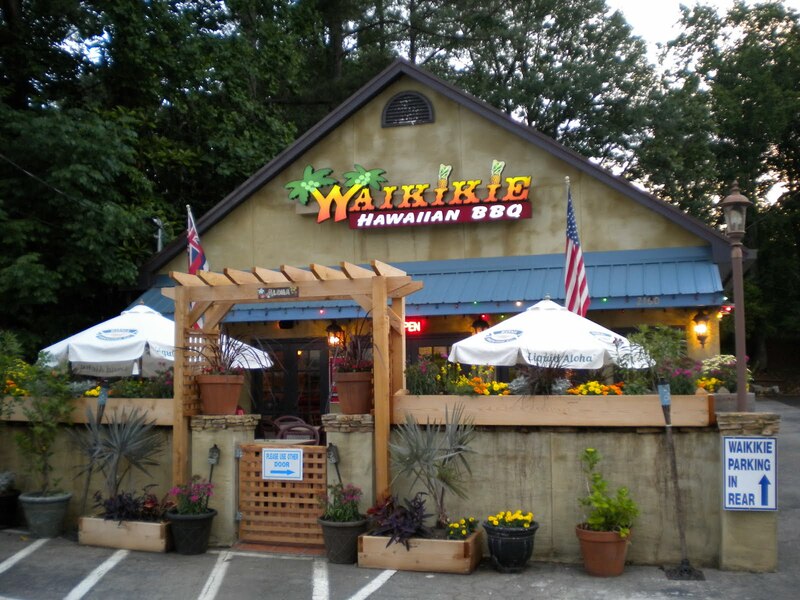 I've driven past Waikikie Hawaiian BBQ on Briarcliff Road so many times, I finally decided it was my duty to check it out. 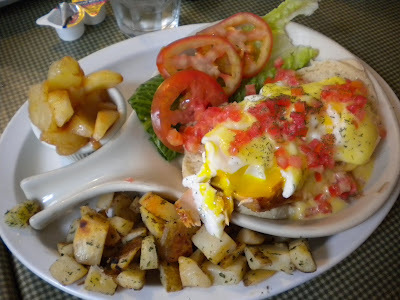 The atmosphere is casual, with puzzles and games for kids and tables inside and outside on the small patio. You order at the counter and your food is then brought to your table. We tried the mini samosas (not pictured), which came out piping hot and with good curry flavor. 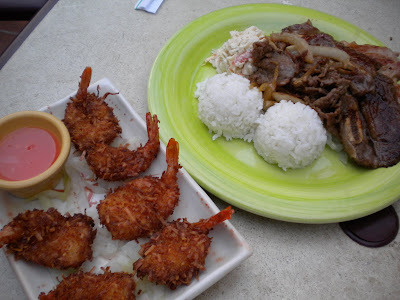 The coconut shrimp and Waikikie combo (BBQ beef, BBQ shortribs and BBQ chicken) rounded our our dinner. The meats were cooked to perfection, with a tasty sauce served on the side. Plenty of Sriracha is also available. The rice here is also exceptionally tasty, as is the traditional Hawaiian macaroni salad. They offer a variety of shave ice flavors, although I was too full to try any during my visit. 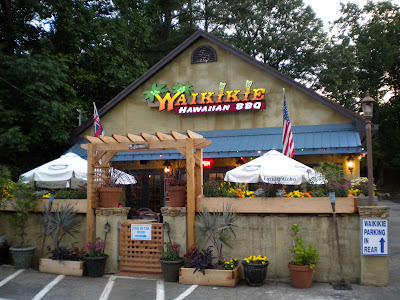 I can't wait to come back and sample more menu items - this is about as close to Hawaii as you can get in Atlanta! This year's annual dinner for the Georgia Association for Women Lawyers (GAWL) was held in the atrium outside the entrance to Il Mulino, a fairly new outpost of the New York Italian restaurant that opened in downtown Atlanta about a year and a half ago. The best part: the do-it-yourself bruschetta and the Parmesan chunks. Apparently these items are delivered to regular diners at their tables inside the restaurant as well. 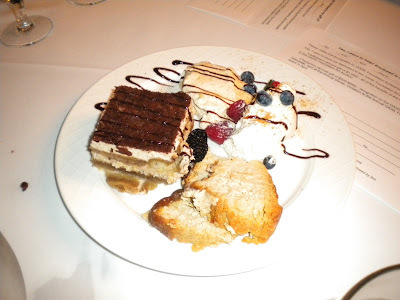 The bread selection was also good and I enjoyed the dessert sampler platter - especially the tiramisu. 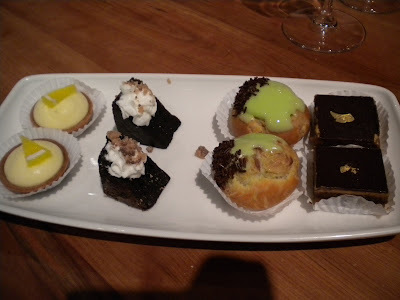 As for the rest of the food, it was fine, but certainly fell victim to the problem most restaurants encounter when serving a plated dinner to a large group: the food tasted and looked like it had been sitting. For awhile. Still, I really enjoyed this venue and appreciate the creativity of the team that chose this place over other more commonly used locations. I'd like to try a meal inside the restaurant sometime to see how their usual service/menu/food presentation differs from the large group meal. Caesar salad - decent but nothing special. 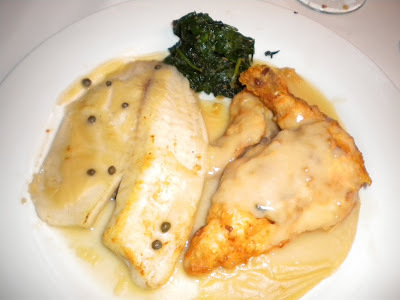 Sole and chicken in a lemon sauce - unfortunately sitting a little too long before being served - typical when dinner is being served to a large group. Dessert selection including good tiramisu. 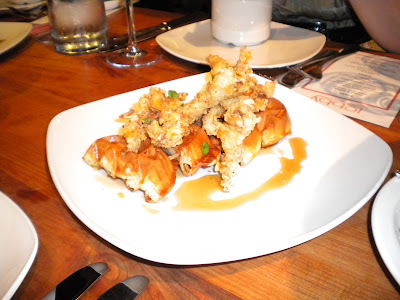 Chicken and waffles: maple syrup, tabasco. I was recently invited to a media luncheon showcasing the new menu of Chef Nick Oltarsh, who has returned to Lobby at Twelve in Atlantic Station after serving as chef at various other restaurants in the Concentrics group. 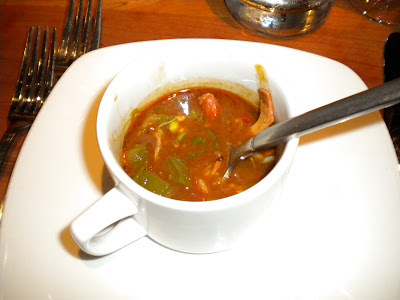 We started with Gumbo, which surpassed my expectations. 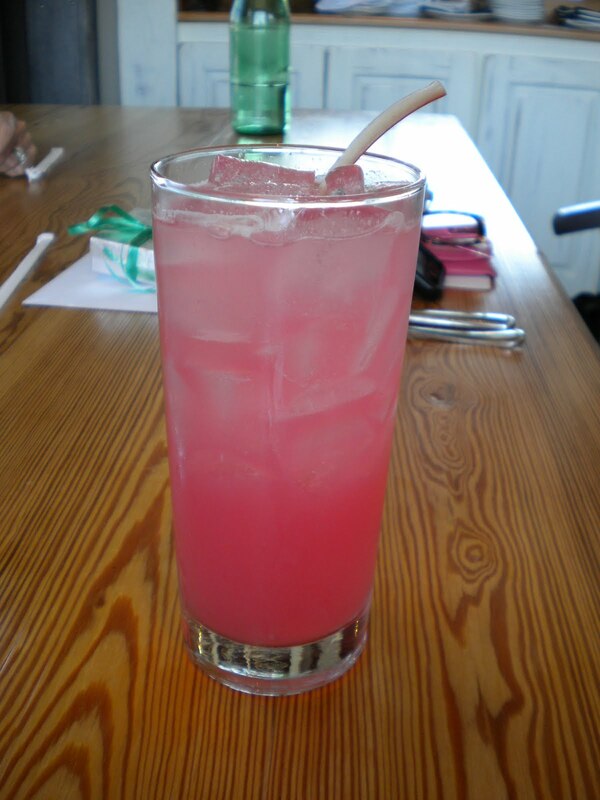 Spicy and flavorful, I would definitely order this again on a cold evening. The chicken and waffles were also pleasing, perhaps because I've always wanted to try this dish and never before have gone for it. The addition of tabasco to the syrup really added something to the dish. I enjoyed the seared tuna, although when I want good tuna, I head to a sushi bar. I did enjoy the flavors presented with the tuna here, however. Gumbo: andouille sausage, steamed rice, scallions. 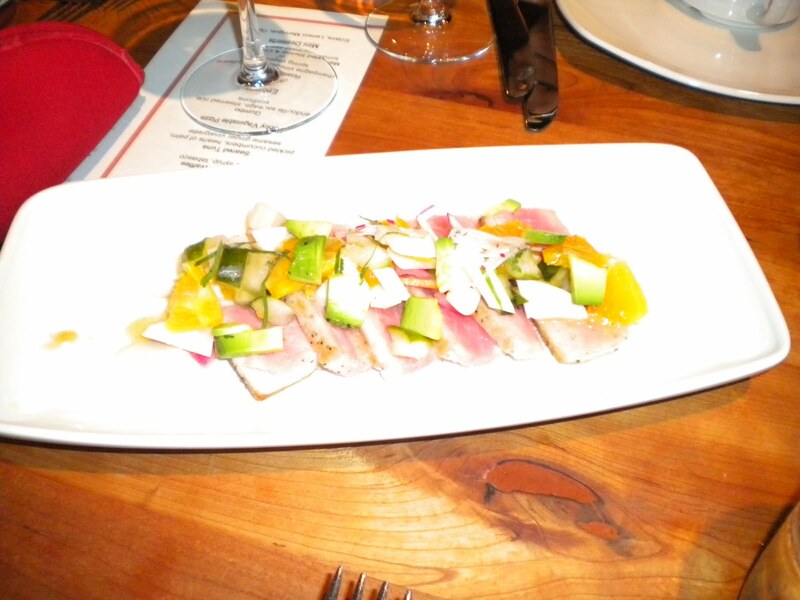 Seared Tuna: picked cucumbers, hearts of palm, sesame ginger vinaigrette. 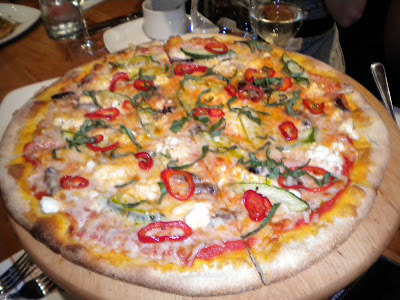 The pizza was pretty good also - I love all the veggies on it and after adding some red pepper flakes, it was spiced just right for me! The shrimp and grits were disappointing, lacking the flavor the many other such dishes convey. I think the grits need something - maybe cheese or cream? I tasted the salmon another person ordered and it was better, cooked properly with a nice sauce. Overall Lobby is a good choice if you're in the Atlantic Station area and need to eat. I don't love the hotel atmosphere and parking is not ideal, although I've managed to figure out how to park just underneath the hotel after a couple visits to the area! I'm glad that Chef Nick has returned and look forward to trying additional items as the menu evolves. 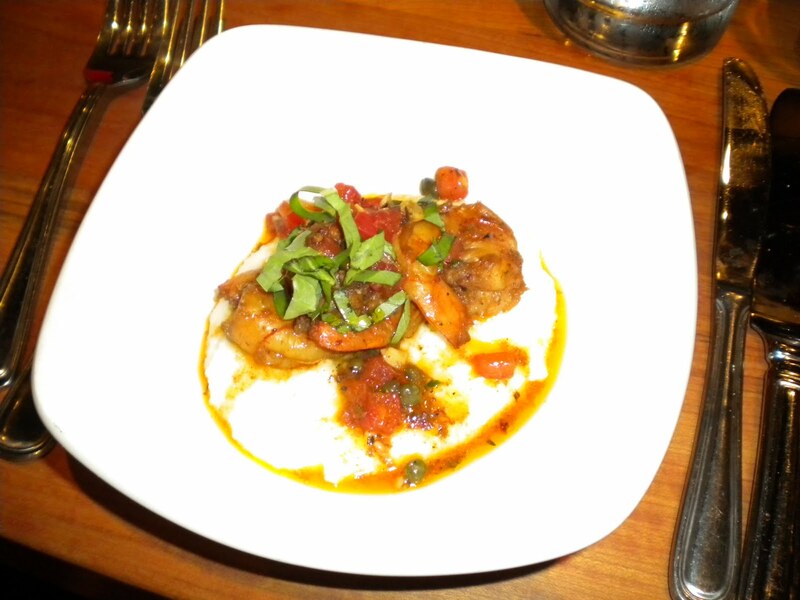 Marinated Shrimp & Creamy Grits: tomato, caraway seeds, capers. 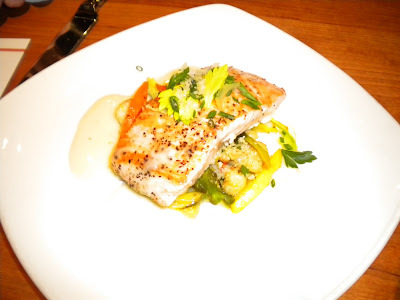 Roasted Salmon: champagne vinegar sauce, julienne spring vegetables. Mini-Desserts: lemon meringue tarts, chocolate cake, eclairs, Opera. Always good to have a little sweet spot at the end! 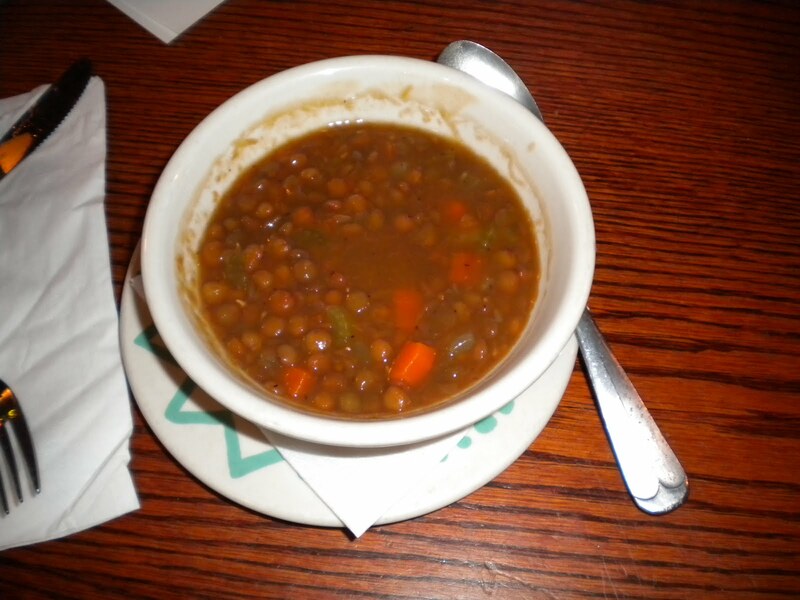 While in the Chicago area for a cousin's Bar Mitzvah, I sampled some of the local Evanston/Wilmette cuisine. Unfortunately with so many events to attend, I did not have a chance to eat in Chicago proper. A good reason to return soon! 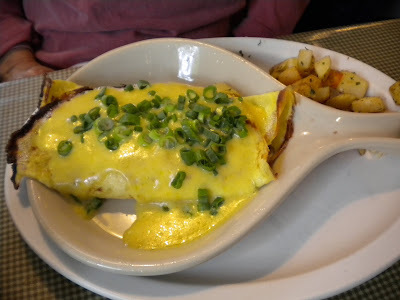 Near our hotel in Evanston, we found Le Peep, a breakfast food restaurant chain with locations across the country. Breakfast was tasty and the option of salmon Benedict very appealing. 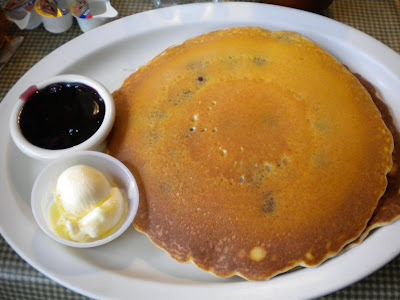 Luckily, my familial dining companions were willing to share with me so that I could have some savory also while enjoying the blueberry pancakes. Even grandma left happy and we all thought the coffee was particularly strong and tasty. Blueberry pancakes - tasty and huge! Upon our arrival on Friday, we met up with family at C.J. Arthur's in Wilmette. I enjoyed the lentil soup as well as the cookies on the dessert platter (not pictured). The fish was disappointing, however, with little flavor, although it did taste fresh. It was very nice of them to accommodate our group - I'm sure our rowdy group gave them a lot to deal with - and the live music was a nice end to the evening. 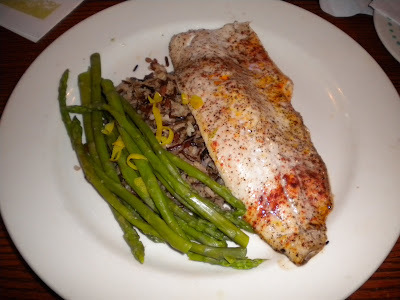 Fish with wild rice and asparagus. Somehow I just got around to trying MetroFresh in the Midtown Promenade shopping center. 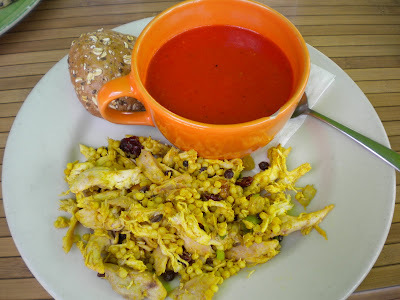 The red pepper melon soup (cold) and curried chicken couscous salad (above) really hit the spot! 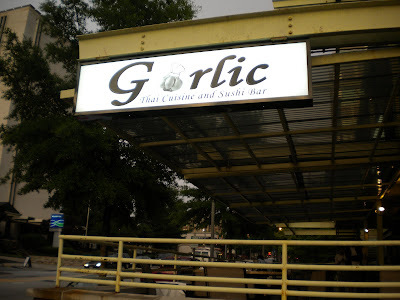 This is a great place for lunch, dinner or Sunday brunch. I love that they have so many great soups, especially the cold soups for summer. They also offer many vegetarian and vegan options. I will definitely be back again soon! 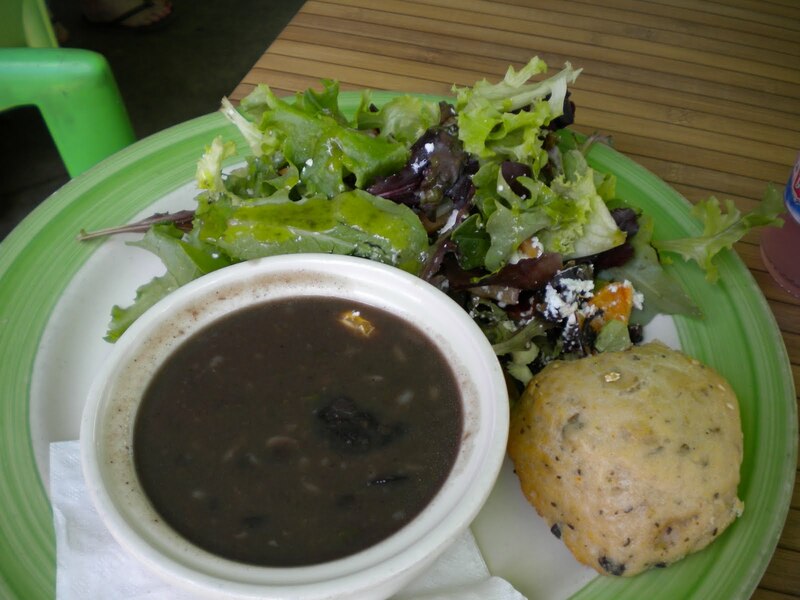 Black bean soup and salad with olive roll. Blueberry Ice Cream topping and Peach Preserves. 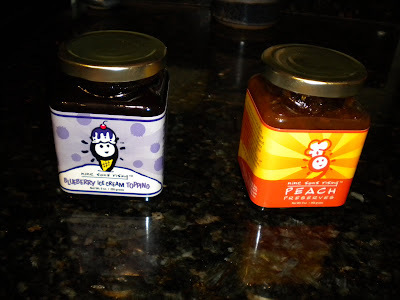 I was recently offered complimentary samples of preserves and ice cream topping from 9 Sons Rising, a South Carolina based company run by two entrepreneurs who happen to have 9 sons between them. 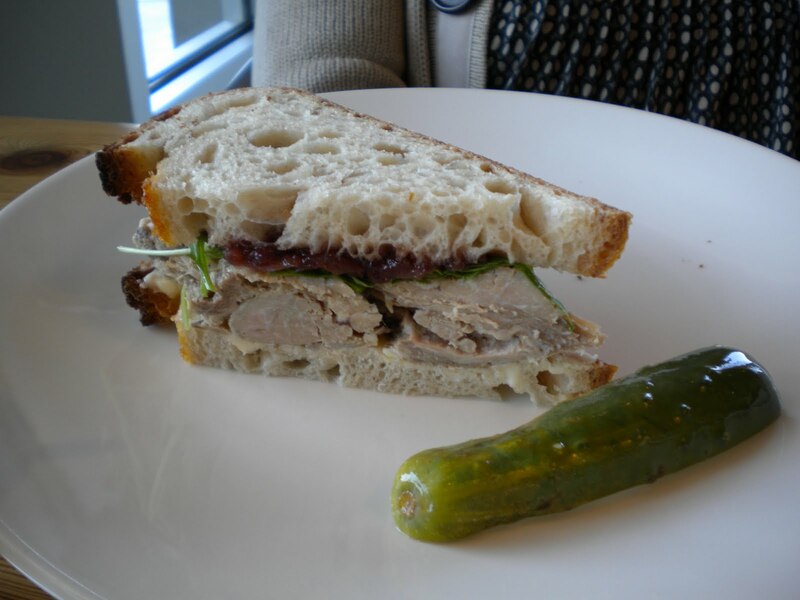 They also offer biscuits, sold at New York Butcher Shoppe and at Whole Foods across the south. I am looking forward to getting my hands on some biscuits soon so I can try the peach preserves with the signature biscuits, currently offered in five flavors including "blue cheese", "devil" and "sweet potato". In the mean time, I've enjoyed the blueberry topping on ice cream and combined with maple syrup as a French toast topping. Paula Kavolus and Jill Bondura with their nine sons. 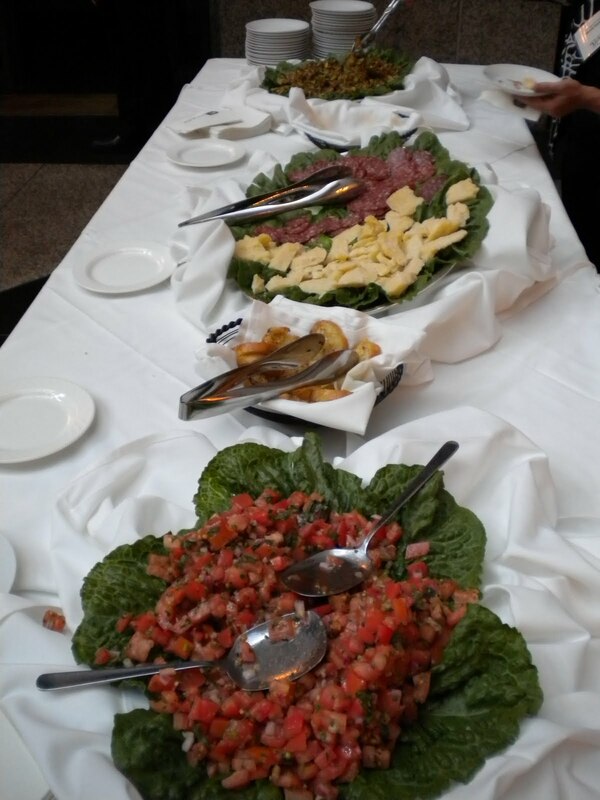 We recently celebrated an office birthday lunch at Miller Union in west Midtown. 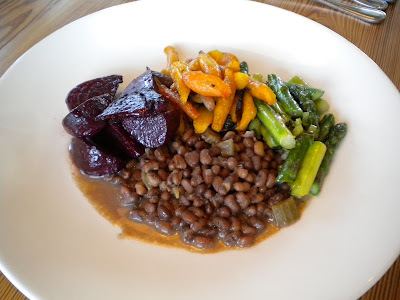 The focus here is on seasonal, local ingredients, so the menu changes frequently. We all enjoyed our choices for lunch, especially the oyster po' boy rendition, which I believe has been replaced with shrimp thanks to the oil crisis and the roasted pork sandwich. The radish and Feta cheese snack is a fresh, colorful way to begin the meal and the vegetable plate pictured above was so colorful and full of taste. The space is rustic, with high ceilings and a nice long bar. I also liked the homemade soda option - and the rhubarb was just different enough but still sweet in a way that embodies the quintessential summer non-cocktail. 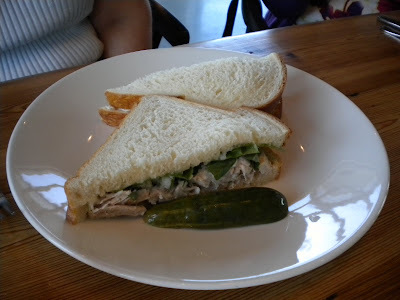 Service was a bit haphazard and we waited far too long to order - at dinner I don't mind a slower pace but for a work lunch, it should be obvious that we can't stay all day. 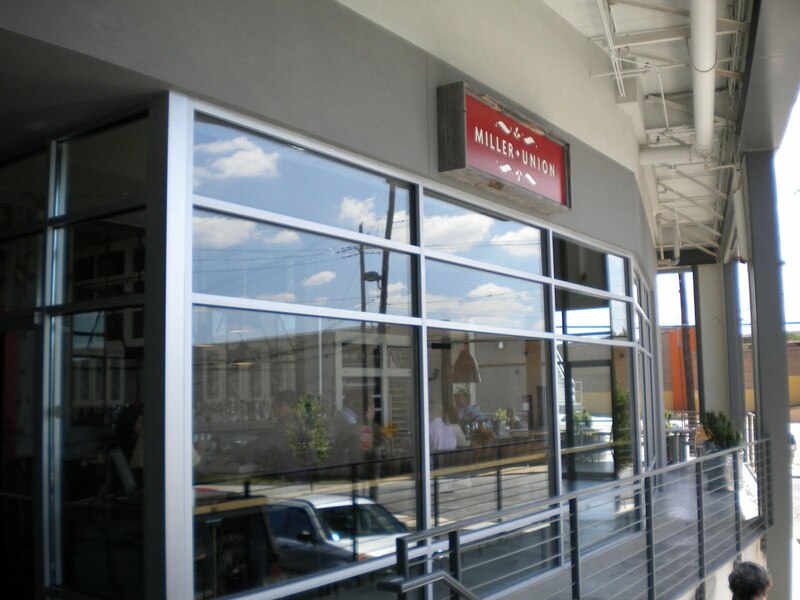 I look forward to trying Miller Union for dinner, including their monthly communal Harvest Dinner, held on the 3rd Tuesday of each month. 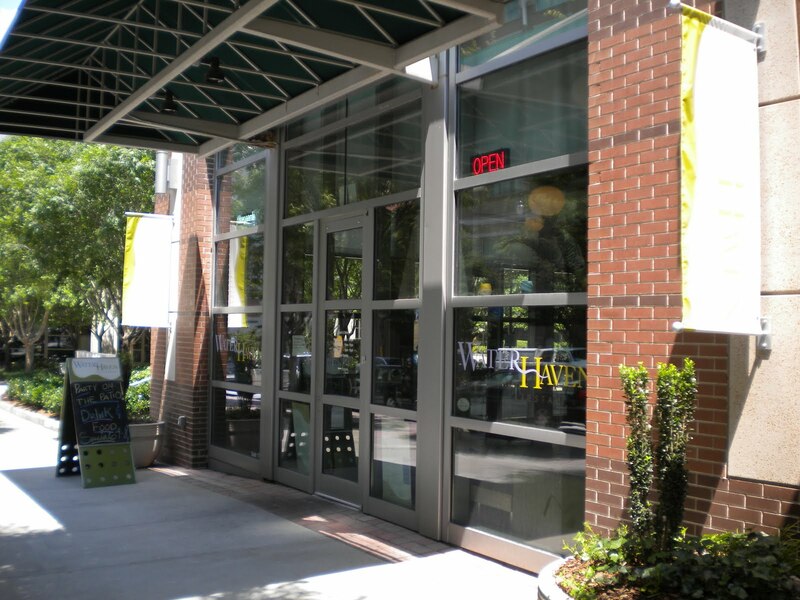 Entrance at the corner of 10th St. and Brady Avenue in West Midtown. 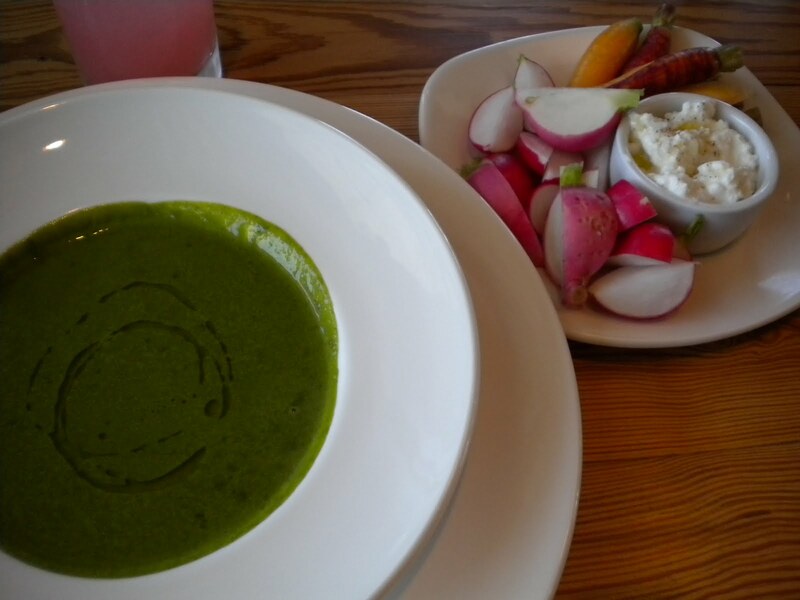 Chilled watercress soup and radish and Feta snack. 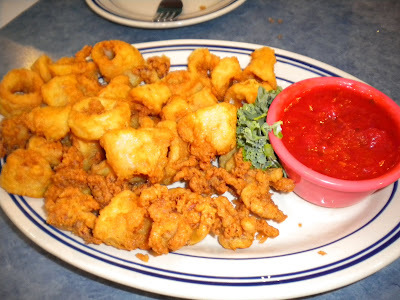 Fried oyster sandwich (now replaced with fried shrimp). We also sampled cinnamon and chocolate ice cream sandwiches for dessert. 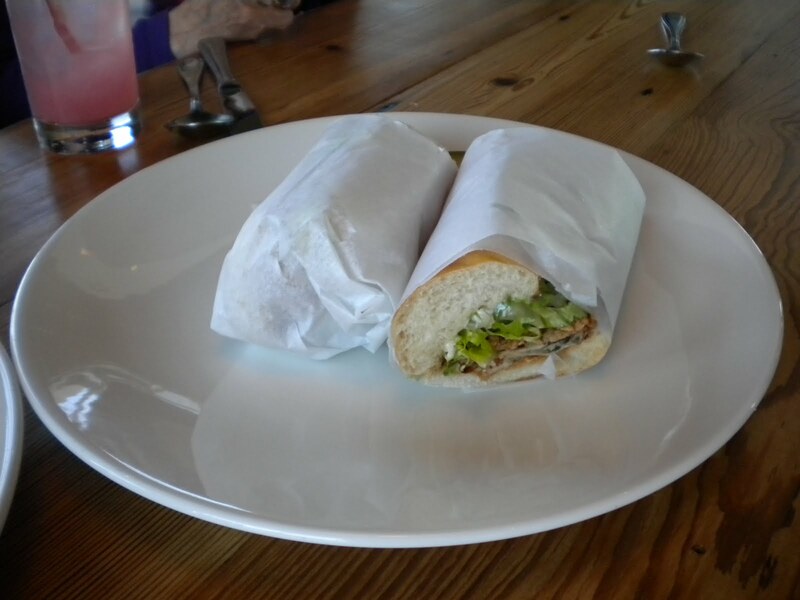 So simple, yet so satisfying - a perfect end to a birthday lunch. 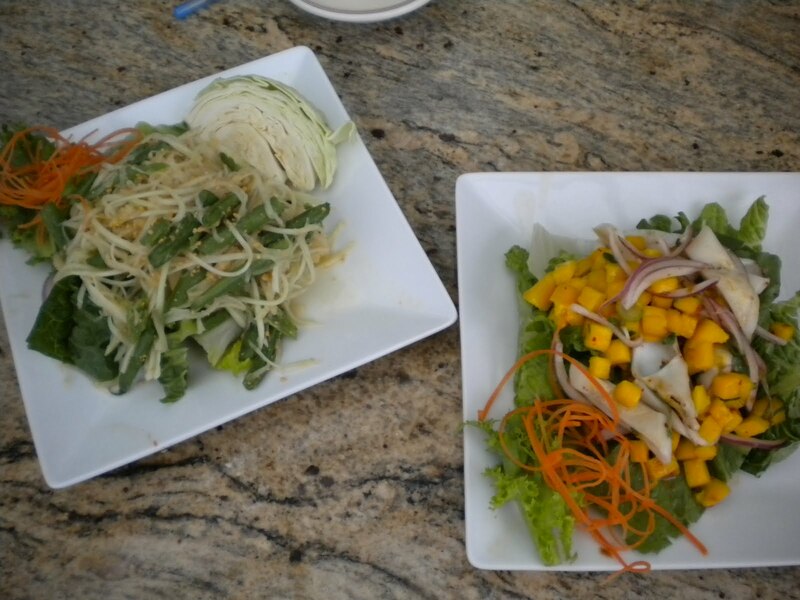 Green papaya salad and grilled squid with mango. We celebrated my cousin's birthday at the recently opened Garlic Thai and Sushi in Decatur. We opted to sit on the patio, where quite a few tables are available for al fresco dining. 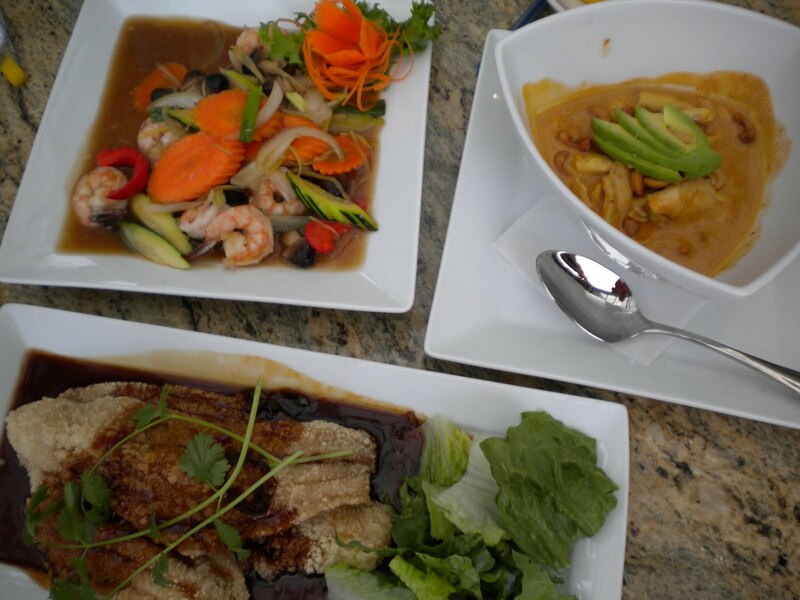 In addition to an extensive Thai menu, the restaurant also offers a selection of "street food", with a separate menu, and a paper sushi menu. 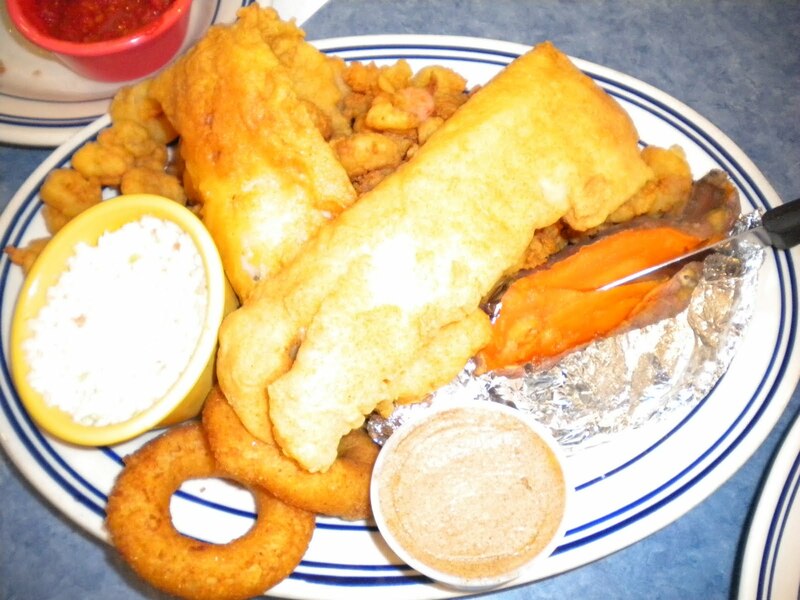 The most outstanding thing we tried is the fried catfish (below). The massaman curry was also tasty and creamy. The sushi we tried did not stand out - the salmon nigri did not have much taste at all and the fish was too thinly sliced. Also frustrating, the server got our sushi order wrong even after scrutinizing the paper menu and asking us about what we wanted twice. It was also odd that the sushi - just 2 pieces of nigri and one roll did not come out until after all the other food was delivered. I could understand this if the place was full, but only about 2 other tables were occupied. Still, we did not try much of the sushi so there could be other rolls that would be better. I'd love to see a sticky rice with mango dessert - one of my favorites. Inside the space has been nicely redecorated and includes photographs of southeast Asia. The restaurant is open for lunch and dinner. Ginger shrimp, massaman curry and fried catfish.